October 23, 1980 will forever remain an unforgettable day of debate in the House of Commons. The Liberal government under Pierre Trudeau was contemplating a measure of closure to prod along the debate on the repatriation of the Constitution. 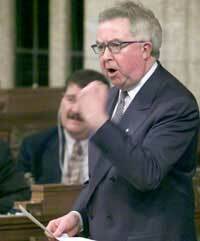 During question period, the leader of the opposition, Conservative Joe Clark (pictured, right) accused him of gagging Parliament. "... will realize that it is in the interests of the people of this country to have this constitutional matter dealt with expeditiously." "Madam Speaker, we know that the prime minister and the leader of the New Democratic Party are heart to heart, toe to toe and nose to nose; and we know where the leader of the New Democratic Party's nose is!" "... check if his brains are not constantly in the area that he suggested somebody else's nose is." Ed Broadbent, the NDP leader rose and began to ask the prime minister a question on oil company profits, bringing on a fresh attack. "Go on over," goaded one Conservative member, urging Broadbent to cross the floor and sit with the government. "Ask him in caucus," joked another. At 3:25 p.m., Speaker Jeanne Sauvé called for orders of the day. When Yvon Pinard, the President of the Privy Council tried to table the closure resolution, the House exploded into a flurry of procedural arguments. After 15 minutes of wrangling, Sauvé suspended the sitting for two minutes to consult with legal clerks, and then overruled the objections to Pinard's motion. It was not the Tories last stand. The last day of debate sending the repatriation of the Constitution proposal to a joint committee of the Senate and of the House clicked into last gear just past 1 a.m., October 24, 1980; when the Deputy Speaker had to interrupt proceedings and call for the vote. MR. DEPUTY SPEAKER: Order, please. The House will recognize the hon. member for Pembina on a matter of privilege. PETER ELZINGA (Pembina): Thank you Mr. Speaker. I demand on behalf of myself and my colleagues the opportunity to participate in this debate. We have a responsibility to those individuals that elected us and I wish to exercise that responsibility. The prime minister gave a commitment that all members of Parliament would have an opportunity to participate in the discussion on our constitution. He has reneged on that promise. TOM COSSITT (Leeds-Grenville): This man is a dictator! MR. WENMAN: You may not! We must be heard! The hon. member for Fraser Valley West will speak in the debate! MR. DEPUTY SPEAKER: Order, please! Will the hon. member for Leeds please sit down? MR. COSSITT: No! I demand to speak! MR. WENMAN: No! I demand the right to speak on the Constitution for the people of my riding! It is my duty to protect my rights as an hon. member! When Francis began to read Pinard's motion, Cossitt and Wenman left their seats in the House and walked to the base of the Speaker's dias. There they pleaded with Francis to allow them to speak. Francis was evidently staggered that the members would rush the chair and so aggressively challenge his authority. "Hon. members can only make speeches from their places. Hon. members cannot be recognized from other places." For endless minutes, the grim face of the deputy speaker stood silently above the chorus of shouting voices, as the very nerve centre of Canadian democracy was under seige. Two Conservatives were now five, having been joined by Elzinga and two other opposition members. The Liberals sat in disbelief. Behind the Speaker's chair, Jeanne Sauvé stood in robes, ready to replace Francis but it was too late. She was no heavyweight Speaker and would have added little order to the chaos. "We want the right to speak!" "I demand the right to be heard!" "This is a free country." "How does this man Trudeau run the country singlehanded like this?" "Totalitarianism! Hitler; that's what it is!" Then, as suddenly as it had began, Francis figured his way out of the imbroglio: he simply looked down and continued to read the resolution. When he was finished, he called for the yeas and the nays. "In my opinion, the nays have it," bellowed Francis, in a last breath of triumph, "Call in the members." What happened next is legend. Ron Irwin, a Liberal parliamentary secretary and former football player noticed a very old and feeble Stanley Knowles approaching Clark, ostensibly to try to get Clark to control his troops. Irwin decided to join with Knowles and walked across the floor to urge Clark to control his members. It was the wrong time for a member of the government to tell the leader of the opposition how to act in Parliament. "You get out of here!" When stocky Conservative Harvie Andre (pictured, right), saw his leader stand and then exchange finger jabs with Irwin, he jumped to his feet. Irwin beat a hasty retreat and the Conservative Whip, Bill Kempling just managed to grab Andre before he reached Irwin. The House had been spared from snap anarchy and the nation would repatriate its Constitution. Mea culpa: the author Lloyd Duhaime worked for Mr. Andre (who died in 2012, RIP) in 1985-1986 when Mr. Andre was Associate Minister of National Defence and later, Minister of Consumer and Corporate Affairs as a political aide and had the pleasure of reminiscing of these events with him on several occasions.